It might sound completely cliche', but when you see my sweet girl hunkered on the couch completely engrossed in a new library book, you know that those trite words are SPOT ON! I looooooove to read, and so does my girl. And like me, she's pretty persnickety about WHAT she reads. Although I assign her particular books to read for school projects, I let her choose her own just-for-fun books. Over the years, and with some helpful guidance, she has learned what qualifies as an appropriate book. When in doubt, she always asks and I help her filter her selections through the Philippians 4:8 grid. While her assigned books are rich in content, her just-for-fun choices lean more towards light, girlie themes. That being said, LIGHT and GIRLIE does not have to equal trivial and shallow. Her interests and choice of literary themes has begun to evolve with her age. But, while she may have grown past many of these titles, most formed such treasured memories, she just can't seem to part with them. And here they are in no particular order. 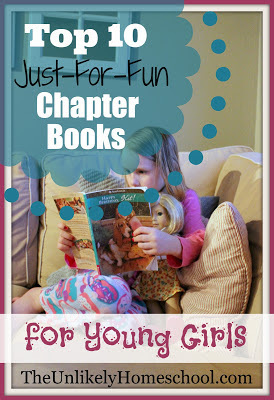 Do you have a book-lovin' young girl? What are her favorite just-for-fun books? We love the Little House series, too! Ooooh...better check out your list! I have a horse-lovin' girl over here! The first chapter book I read to my daughter was "The Ordinary Princess" by M.M. Kaye. I had never heard of it before, and a friend gave it to my daughter for her fifth birthday. She, of course, wanted to start reading it right away. It took a chapter or two before it really captured her interest, but by the middle of the book she was completely enraptured and begging me to read more! When we finished the book, she immediately said "read it again!" I really credit this book with sparking my daughter's love of reading. I know it will be one she returns to again once she is reading fluently on her own. We read Charlotte's Web earlier this year, and are working through the Little House books now. She has loved all of them so far, and my husband and I both have fond memories of the Little House books growing up. My husband learned to read using those books, and I have warm memories of snuggling up with my grandmother as she read them aloud to me. 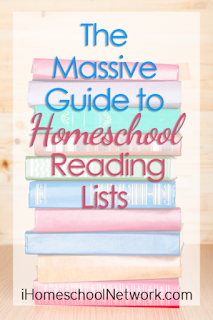 Thank you for sharing this list! There are a couple on here I haven't heard of before, so I'll be checking those out! I'll have to check out The Ordinary Princess. I'm not familiar with that one. Sounds like a page turner! When I was younger I absolutely loved the Mandi series. I will definitely introduce my daughters to them when they are older. Yes, I loved Mandie books too when I was little. My daughter just has never seemed to like them. I'm thinking she maybe tried one and did not like that particular story line and was turned off to the whole series. Might need to re-introduce her. I am also a book loving mama with a book loving girly! That's a fabulous list! 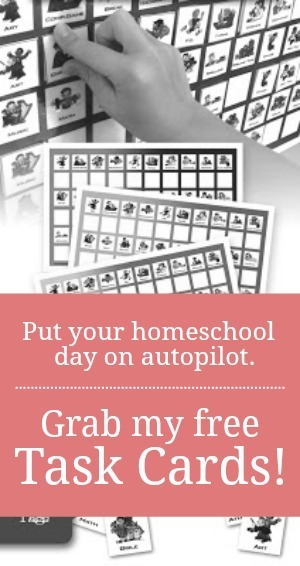 Also check out Homeschoolliterature.com as there is a great list of books that are about homeschoolers and by homeschoolers. The original Box Car Children is my favorite book of all time. I read it to my daughter a few years ago and we keep reading the books in the series. After awhile though, we both got tired of the series, because it was the same thing over and over. Thank you for this list. We read Sarah, Plain and Tall not too long ago and I had no idea there were other books after it. I was never much of a reader, so even some of the classics, I have not read yet. Yes, that includes Little House on the Prairie. The Ramona Series by Beverly Cleary. They are TIMELESS! I enjoyed them as a girl and now my daughter absolutely adores them. Great list (really, love them), but all very samey - Classic Americana or Animal stories. 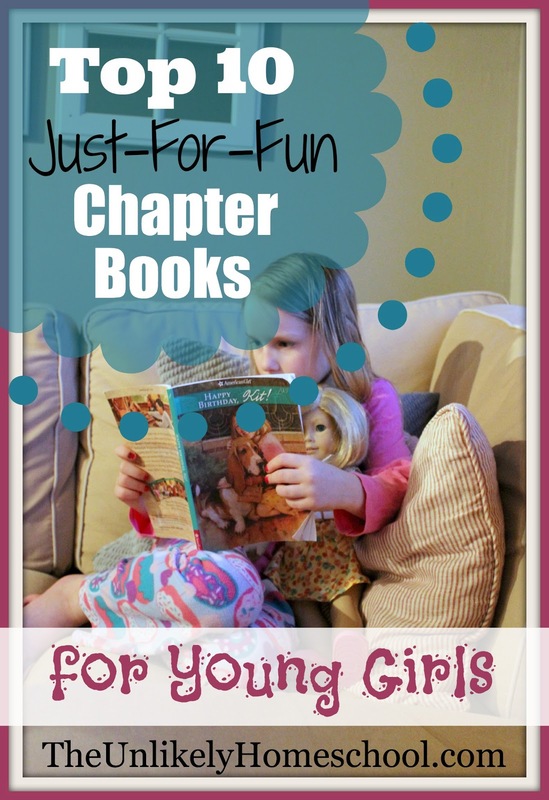 There are SO many other adventures a young girl reader could take. Go to Japan with Sadako and the 1000 paper cranes, England with the Secret Garden or Mary Poppins, or a fantasy world with Ella Enchanted. So many choices and worlds. Yes. I agree all of those are good ones and ones my daughter has enjoyed, but this list was meant to be a "light" list for quick reading. Love this list! Stumbled upon your blog through Pinterest and I will definitely check out your other lists. Love how you screen your books through Philippians 4:8.